White Chocolate Lemon Butter Cookies. I’m choosing lemon over chocolate today. Things are nuts. 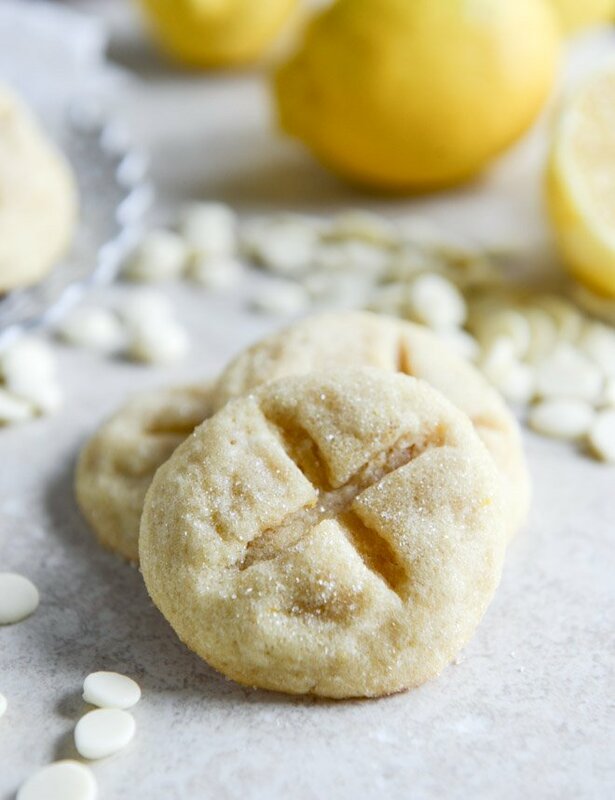 This is the second recipe I’m sharing for the month of cookies over at Better Homes and Gardens, and I can say that my lemon obsession is back with a vengeance. For this cookie, I used this tangerine butter cookie recipe and simply swapped the tangerine with lemon and threw in about 1/2 cup of white chocolate chunks. I’m so hooked. These cookies have a new-to-me cookie ingredient inside of them and that’s white cornmeal. I can’t even believe how chewy it makes these guys and I could not stay away. They have been added to my ever-growing list, that’s for sure. Don’t even know what I’m going to do with myself. I know things were a little confusing last week with the chocolate pistachio cookies since the recipes are shared differently than I do here on my site. All month, I’m taking a classic BHG cookie recipe and putting my own spin on it. The original recipe will always be linked here and in the BHG post, and the (very simple) changes I make are shared in their post as well, paragraph style. For these beauties, it’s just an easy switch of lemon and the addition of white chocolate. Nothing crazy, just crazy delicious. You can find these little gems over here, and now I’m gonna go eat about four more for breakfast. Pretty! I always love when people bring lemon cookies to parties, since I rarely bake them myself (no idea why)! Love these. These look wonderful! I made a key lime white chocolate chip cookie a couple week ago and loved the flavors but didn’t love the texture of the cookie…I’m going to have to try this recipe with lime, because it looks perfect! The white chocolate and lemon combo sounds fantastic! Off to check them out! That’s awesome that you are posting for BHG! I am going to pin it from there! These look incredible and those toothpick shots are fab! Yum! These look so cute & delicious! Wow. I’m not sure if I would choose lemon over chocolate, but I might if the lemon was in the form of these cookies! These look great! Yum! Am I missing how much olive oil you put in? the recipe calls for 3/4 cup – that’s what i used! Love how dainty these are! Delicious combo! These are SO PRETTY! Plus lemon and white chocolate is such an amazing combination. What a perfect cookie..yum! These look absolutely delicious! This is one of my favorite flavor combinations, plus they are so cute! Thanks for sharing this yummy looking recipe! As if you need another question about this recipe … did you use orange extract as in the original BHG recipe or did you swap it for lemon extract, since you went all lemon on us? These look delicious, and so pretty! They look like sand dollars! :-O I love lemon baked goods! This is now added to my recipe book. Great recipe! I used grated peel from a whole lemon and 1 cup of white chocolate chips. I also used about half walnut oil because my olive oil was extra vigiin. Got to try tangerine next-white chocolate is de rigueur! I love lemon pastries! This looks so good and too cute for words. I have not tried out white cornmeal yet, but I have been dreaming of a lemon and white chocolate dessert for quite some time. Way to come to my rescue. Perfect timing as i just purchased a bag of lemons! Making these right now! They smell good! I love love lemon so hoping they turn out good!! I made these cookies last week. I was worried about the Olive Oil and how it would affect the smell/taste. It was not a problem! However, I did have an issue with the Corn Meal. I felt that it made the cookies grainy. Anyone else? Where can we find this recipe?